There's a touch of Luc Besson influence floating around Idris Elba's latest film, Bastille Day, a Parisian set thriller that sees he and rising star Richard Madden team-up to cause a little destruction. Eden Lake and The Woman in Black's James Watkins adds another string to his bow as he directs this slick, highly entertaining action caper. This debut screenwriting project from Andrew Baldwin, sees CIA agent Sean Briar (Elba) team-up with a young pickpocket (Madden) to stop a corrupt counter-terrorism unit from committing a high-stakes robbery. In a cinematic world where many a film is a little too long, needless overcomplicated with a multitude of subplots, and drowning in a pompous sense of self-righteousness, there is a refreshing simplicity to films like Bastille Day. That's where my earlier comparison to Besson comes in, he's one of the few filmmakers willing to push the boundary on an action flick and dare I say let things get a little over-the-top in terms of dry one-liners, self-referencing, and outrageous action spectacle. There's an element of this to found in Watkin's approach to Bastille Day which provides an unchallenging, breezy action romp free from the dour conventions of many a contemporary counterpart. In a performance that is likely to be dubbed his audition for the James Bond role, Elba brings a familiar tough-talking charisma and debonair swagger to the role of Briar - one that has little more dimensions than being a tough Yank - and that's all we really need to know. He breezes through the picture embarking on highly-charged chase, weaponry and physical combat scenes, always remaining an engaging screen presence who carries the film with an unforced coolness. 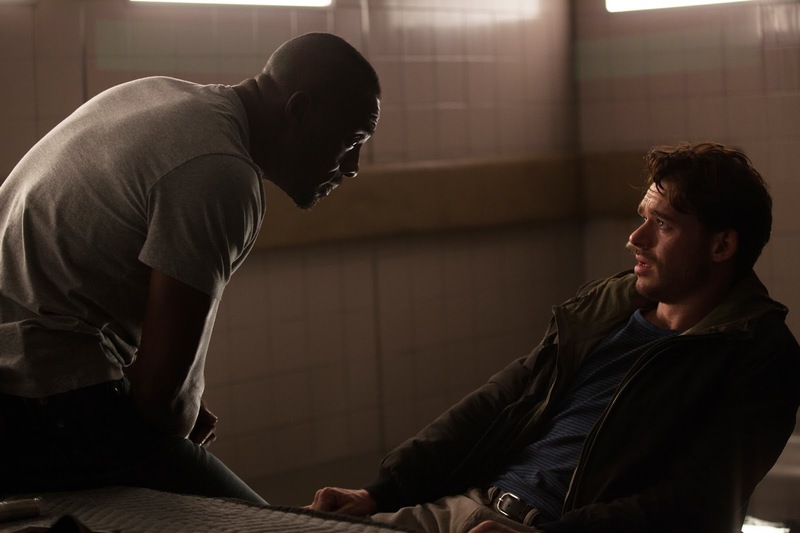 There's familiar odd-couple tropes piled on when Richard Madden's young pickpocket gets roped into the ensuing chaos, but like Elba, Madden has the charismatic chops to effortlessly ride along with his co-star. Madden as the over-zealous young petty thief and Elba as the authoritarian cop make an enjoyable pairing, albeit one that is sure to drift from your memory within a few hours. Baldwin's narrative tackles some ambitious themes but is constrained by genre conventions which means it is never going to reach a satisfactory depth. However, glimpses at the problems at the heart of left and right wing political society in France, police corruption, and social media activism add some flair of originality to the proceedings and ensure there's more to Bastille Day than gunfights in the French capital. The film steers clear from anything that might parallel or allude to the recent travesties in France, arguably a safe move. There is impressive stunt work throughout, alongside fast-paced editing from Jon Harris, whilst cinematographer Tim Maurice-Jones captures the bustling metropolitan aesthetic at the centre of Paris. Bastille Day is an effortlessly enjoyable slice of high-octane action fun. Although plotting can be a little thin, Elba and Madden's chemistry and wry performances, alongside sharp direction from Watkins ensure this is a real treat.